Welcome back DANGER fans for another exciting adventure. Lately, as you may know, I have not had much good luck with sandwiches. They’ve been subpar at best, and for this I apologize to both you and my tastebuds. While deciding on my next entry for this most delicious of blogs, I felt the best way to get back on track would be to again sample something from LA Magazine’s 17 Best Sandwiches of Los Angeles. It just so happens that one of these sandwiches was recommended to me awhile ago, and now I know why. This week, I tried a Pork Banh Mi sandwich from Banh Mi My-Tho in Alhambra. Truly an adventure into the dark recesses of Los Angeles, it took my five different freeways to reach the tiny corner strip mall that housed this mecca of Vietnamese sandwiches. Starting on the 405s, I traversed the 101s, 134e, 5s, and finally the 10e. It may sound like a lot there dear readers, but continue reading because I think you may be interested in taking this pilgrimage into the San Gabriel valley as well. One thing I’ve learned since moving to Los Angeles is that food made in strip malls tends to be quite excellent. Tacos, falafel, sushi, whatever. 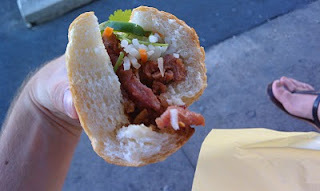 It all provides a delicious dose of DANGER, and this Pork Banh Mi sandwich was no different. For those that don’t know, Banh Mi is a Vietnamese sandwich on a french baguette, with roasted pork, and pickled vegetables, typically cilantro, shredded carrots, onions, and jalapenos. Let’s start with the bread, shall we DANGERites? Flaky. Slightly crisp. Delicious. It’s deliciously golden and almost melts in your mouth with each bite. A terrific match for the enticing insides. The pork is served hot, and is slightly sweet, as if it were slow roasted in honey. Not only is it sweet, it’s incredibly tender. The meat easily pulls apart and is really one of the best pieces of pork I have ever tasted. The pickled vegetables add a nice crunch to the sandwich. Even though they’ve been pickled in vinegar, the flavor isn’t as pungent as one would think. In fact, the pickled crunch is a nice complement to the sweet pork and soft bread. The jalapenos were the final piece to this delicious puzzle. Jalapenos are one of my favorite peppers, and for two reasons: 1.) they have one heck of a kick. I love them when they’re hot. 2.) remove the white membrane inside and they’re not so hot anymore, just smoky and delicious. 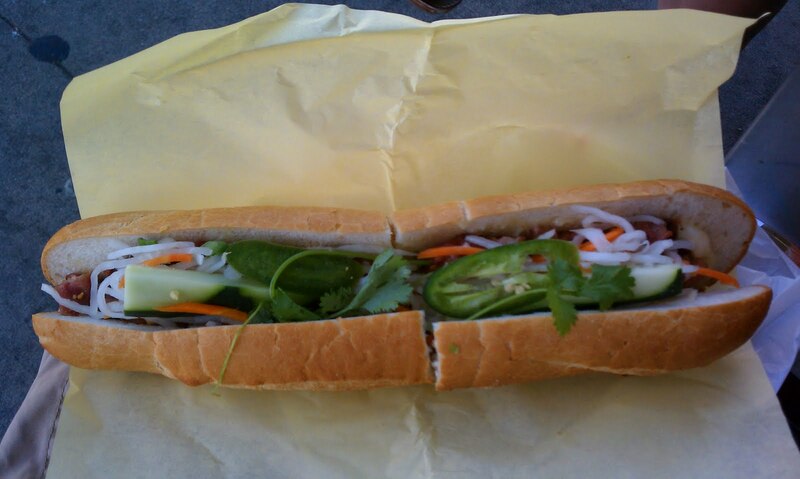 The Pork Banh Mi’s jalapenos fall into category two. Crunchy, slightly smoky, and just a slight bit of heat, these peppers perfectly counterbalances the sweet roasted pork, while adding more crunch to the sandwich. Despite its relative distance to most of Los Angeles, this sandwich is definitely worth the trip. Even better, the sandwich and a drink only costs $4 total! I couldn’t believe it when I was rung up. That is truly an unheard of price for such a delicious sandwich. 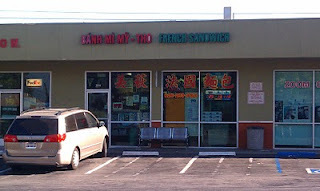 If you’re in the Los Angeles area, and up for trying out a well hidden Vietnamese sandwich, you’d definitely be in store for some serious DANGER. Lastly, with the past weekend being a holiday weekend, I of course attended a BBQ. 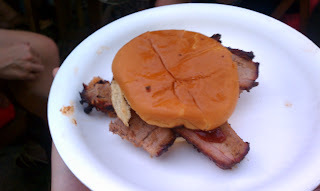 And I wanted to give a shoutout to Chris Reiser, who crafted this delicious smoked brisket sandwich (smoked for 10 hours, topped with barbecue sauce and a soft hamburger bun). Tender and full of flavor, this is truly a DANGERous treat. First, Vietnamese food is always super tasty and yes, cheap! Marc and I frequent this one place that has delicious pho and phad thai. Second, I never knew that about jalapenos, removing the membrane and all. I gotta try that. I like some heat, but I gotta have flavor besides heat. Maybe I should try something....healthier.